Vampires are a classic Halloween costume that have come back in recent years with the success of Twilight. Here are a few elements of vampire costumes from classic to modern styles. What Kind of Vampire Do You Want to Be? Before you put together your vampire costume, I bet you already have a good idea of what type of vampire you want to be. Below, you'll find costume tips and tutorials for every type of popular vampire, including blood recipes, fake fang tips, and classy accessories. Well, what kind of blood are you in the market for? Thin blood to run down the walls, or a pack of edible guts? Here are my 8 Fake Blood Recipes that I mixed up and tested just for you. With the success of Twilight, many young costumers are opting for a more casual vampire look ala Edward and Bella. These are really easy to do because they don't require any fancy elements. Twilight vampires have a style all their own that deviates from the damp, gothic catacombs of Dracula or Lestat. Learn how to create this sparkly modern wonder. The lofty and sophisticated vampires of lace and leather are a standard approach to a blood-sucking persona. One way to accomplish this look without spending a lot of cash is to hit your local thrift store with old-fashioned touches in mind. 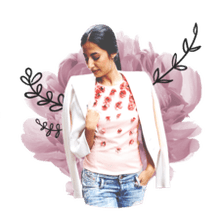 Thrift Store Finds: Pick up a pair of boots or dark heels at the thrift store but don't waste your time looking for the right puffy shirt and period-style hat. Guys, try to find an old suit that comes close in fit. DIY Easy Costume Pieces: For a cheap ladies costume, you can make many elements that are expensive in stores. You can always go with the old school Dracula-style of vampire. It never goes out of style and is immediately recognizable. 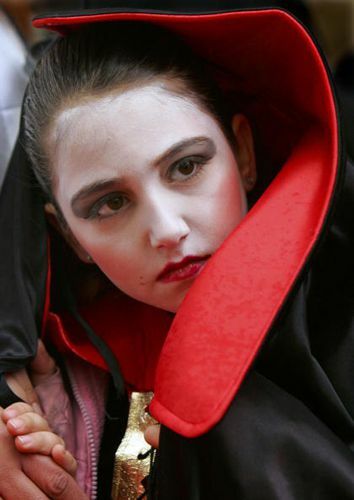 The traditional white face and draping cape of a Dracula-era vampire are always a hit with the kids and materials for these costumes are easy to find. Ladies: Create a corset top to wear with a white dress shirt. Wear a dark skirt, long or short. A pair of boots or heels will both work with this look. Make a long hooded cape, and style your hair in a neatly polished look. Guys: Wear a white shirt with a vest. Red and black work best for Dracula vest colors. The small tie at Dracula's neck can be imitated with a simple piece of black ribbon tied under the collar. Wear a pair of dress pants and nice shoes. Don't forget to slick back your hair and add a small 'widow's peak' at the middle of the hairline with a bit of dark makeup that matches your hair color. Adding a touch of death to your face is universal among all vampires costumes. For all vamps, a little bit of purple and red under the eyes gives a good undead impression. Powder the entire face for a white look. White cream makeup can be used, but apply sparingly, blotting and blending well. Make a batch of fake blood to drip at a corner of the lips. Add dots on the neck for a bite. Ladies: Apply a generous amount of mascara and makeup to the eyes. Victorian vamps are always gorgeous and without facial flaw. Skip the blush to maintain the death look and apply a dark lip color. Guys: Add the dark circles under the eyes and create a slightly hollow cheek by blending a light sponging of black makeup under the cheekbones. Don't overdo it. Let's face it. One vampire accessory that is hard to go without is the teeth. Here are some sources to find a set of teeth that won't make you look like you've got a mouth full of mini marshmallows. Stage Fangs (Compare Prices) by Toynk Toys are a cheap option. Fangs with Fake Blood Capsules by Scarecrow come with stage blood to help complete the look. Custom Fit Fangs from Costume Express are a dental cap kind of fang that snap in place. A truly great costume is created with lots of details. Jewelry can fill in your look, and these glittering touches can be made for free.